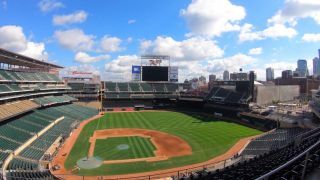 Sitting in the heart of downtown Minneapolis, Target Field is home to Major League Baseball's Minnesota Twins, and accommodates more than 39,000 eager spectators ready to cheer on their team. Though designed as a baseball venue, it also hosts football, soccer, and a wide range of outdoor concerts and various non-sports-based corporate events. Technicians needed a way to easily and inexpensively expand the number of inputs and outputs to the stadium's main console to better mix, manage, and control the total system. Their search led to the Dante audio network platform from Audinate. "We started using Dante to connect the control room to the band stage, and this step alone brought 16 channels from the band to my main console—a huge improvement for us," said Jeff Pedersen, lead audio technician, Minnesota Twins Baseball. "Our plan now is to get Dante into all of our remote locations and bring all the control and mixing to our main control room."